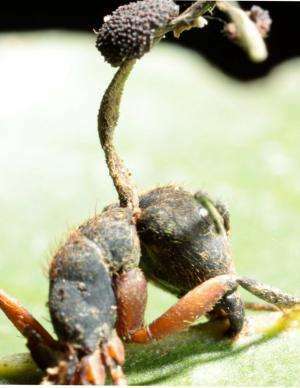 A parasitic fungus that must kill its ant hosts outside their nest to reproduce and transmit their infection, manipulates its victims to die in the vicinity of the colony, ensuring a constant supply of potential new hosts, according to researchers at Penn State and colleagues at Brazil's Federal University of Vicosa. Previous research shows that Ophiocordyceps camponoti-rufipedis, known as the "zombie ant fungus," controls the behavior of carpenter ant workers—Camponotus rufipes—to die with precision attached to leaves in the understory of tropical forests, noted study lead author Raquel Loreto, doctoral candidate in entomology, Penn State's College of Agricultural Sciences. More information: The research was published today (Aug. 18) in PLOS ONE.